Indeed, the Fed was hawkish last week. It pointed out that the gains in employment, household spending, and business fixed investment haven been solid, while the unemployment rate remained low. The U.S. central bank also noted that the market-based measures of inflation compensation have increased in recent months. Inflation on a 12 month basis is expected to move up this year and to stabilize around the Committee's 2 percent objective over the medium term. The message is clear. The next interest rate hike is coming. Traders understood the signal. The market odds of a March hike increased from 67.6 percent one month ago to 77.5 percent. The flutter of the hawks’ wings may blow out the golden flame. In 2017, the yellow metal used to weaken ahead of an interest rate decision. On Friday, the Bureau of Labor Statistics revealed the latest report on the employment situation. The U.S. economy added 200,000 jobs in January. It was a positive surprise, as analysts expected 175,000 job gains. Moreover, the average hourly earnings rose 9 cents to $26.74, which means that they jumped 2.9 percent over the last twelve months. It was the best result in the current recovery. The weak point of the report was the downward revision of past numbers: employment gains in November and December combined were 24,000 lower than previously reported. However, the labor market remained solid, with 192,000 job gains over the last 3 months. The strong payrolls and the uptick in wages may push the Fed to adopt a more aggressive stance. It could also strengthen the U.S. dollar, rattling the gold market. Indeed, the greenback rose against the euro after the report, while gold prices declined, as one can see in the chart below. Chart 1: Gold prices (London P.M. Fix, in $) in 2018. Although the Fed leaved the federal funds rate unchanged at 1.25-1.50 percent, the January monetary statement was more aggressive than expected, setting up the March hike. Gold should weaken in response. And indeed the price of the precious metal dropped – but the major hit came only after strong nonfarm payrolls. It signals that gold’s rally may continue, in spite of a more hawkish Fed. 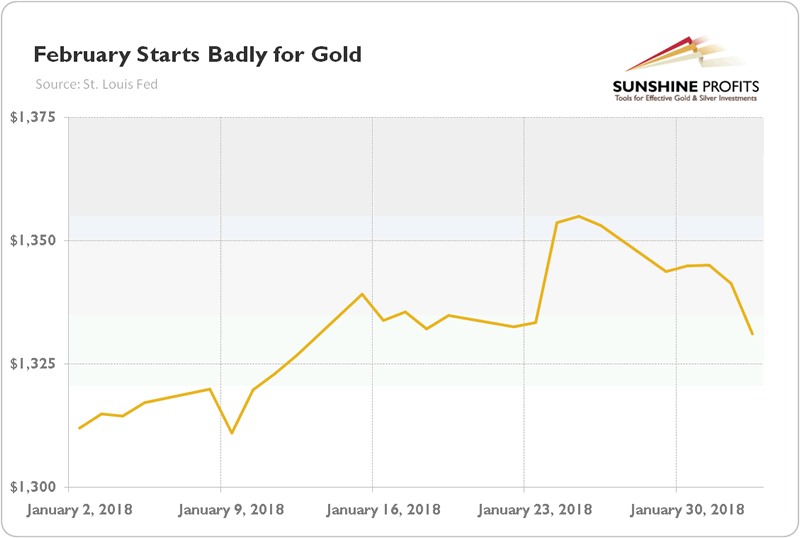 If the U.S. dollar generally stays in a bearish mood after the recent rebound, gold will survive the gale of higher interest rates. On Thursday, we will analyze the impact of the current sell-off in stocks on the gold market from the fundamental point of view. It might not be what many gold investors would expect. Stay tuned!